We finally made it to the end of the first season of Gotham, and boy has it been a doozy. For all of its flaws and questionable choices, it is always entertaining and this week is no different. We have the return of Fish Mooney, the creation and practically the resolution of a city wide gang war which makes the city turn into Gotham: Beyond Thunderdome for some reason. There is plenty here to talk about, and not all of it is good. There were a few surprises including one death that I don’t think anyone anticipated, and another death that we all knew was coming, but enough hemming and hawing, it’s time to get right down to it. I won’t bother with the setup too much and I’ll just go straight into the biggest moment that left me wondering what the hell the writers were thinking. Barbara Gordon has been on a really crazy arc this whole season, going from boring girlfriend, to scared girlfriend, to disappeared ex-girlfriend, to serial killer girlfriend slash hostage, to crazy psychopath. She has healed up from her little neck cut and bruises from her time with the Ogre and decides that she wants Leslie to be her trauma counselor, during which time she reveals that it wasn’t the Ogre that killed her parents, but it was actually Barbara herself that killed her own parents. Then we get a bit of a Shining moment where I half expected Barbara to peek her head through the hole in the bathroom door and shout “Here’s Johnny!” But instead, there’s just a catfight that ends with Barbara unconscious on the floor, possibly dead but most likely just unconscious. 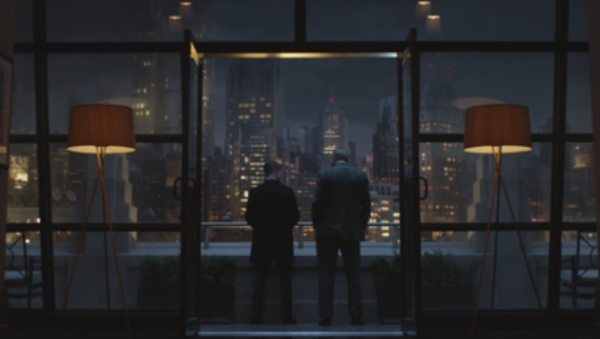 After which it just cuts back to Gordon and Falcone having a little heart to heart that was honestly the best scene in the episode but I’m jumping ahead a little bit too far so I’ll come back around to that one in a moment. 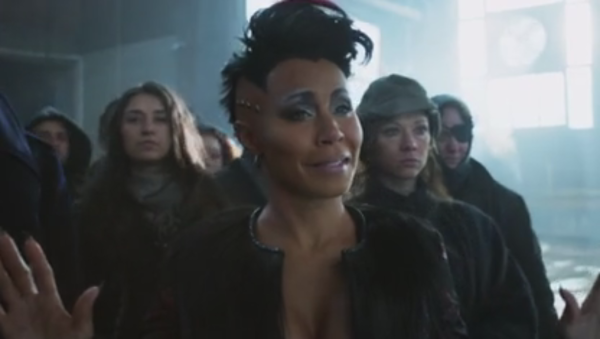 But what the show has really been waiting to set up was the return of Fish Mooney, and she comes in with style standing at the head of a little boat being propelled by about a dozen rowers. She meets up with Cat and when it jumps ahead a couple weeks later she is looking like she belongs in the new Mad Max movie with some crazy hair. In the mob war between Maroni and Falcone which was started by Penguin, Falcone ends up being a pawn in the struggle between Gordon, Fish, and Maroni. I will give credit where credit is due where I completely believe that Penguin knew exactly what he was doing when he planted the seed of conflict between Fish and Maroni that eventually ends with a bullet in Maroni’s head. I don’t think anyone saw that one coming, even though he is a minor character in the Batman universe, he is someone who plays a part in the mob scene. It’s less surprising that Fish meets her end at the hands of Penguin while Butch struggles with his Zsass conditioning. Of course, she did fall into the water where her body won’t be found so there’s always a chance that she might show up in the future, but I think most of us are glad that she’s dead. A couple other minor characters that get pushed along in their own character arcs a little bit too far are Cat and Nygma. Cat ends up being a little gangster in Mooney’s Beyond Thunderdome squad where she seems perfectly happy to have Falcone, Gordon, and Penguin killed even though we never technically see her do any actual killing. 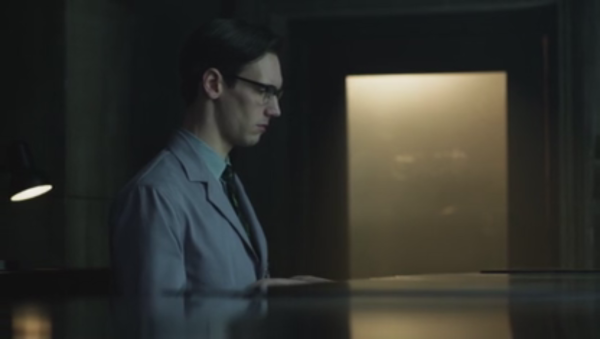 Meanwhile Nygma has one of the worst scenes in the episode where he gets confronted with his own hubris. Kringle discovers his little riddle in the note he forged, and while he denies it to her face, when she leaves he has this whole Smeagol conversation with himself about what he’s going to do about it. It’s done with quick cuts and double exposures that show him in several different places at once, he’s having a conversation with himself about how there is no evidence, but it’s likely that she will keep digging and he may just have to do away with her. It felt very 90’s, like something that would have been done on Millennium, and while that was a great show, it was very much a show of its time. Finally, to wrap the episode up Baby Bruce discovers the secret entrance to the not-yet-Batcave. We don’t get to see inside of it, but we know that it’s a place where his father would be for hours at a time. It felt mostly like filler and setup for next season, but it was an alright moment to end on. Aside from that, the episode was full of moment after moment that left me wondering what the hell I just saw, and usually not for the best reason. But it certainly went out with a bang, and I am very curious what direction it will go in season two. I’ll have my full thoughts on the ups and downs of this season next week so be sure to come on back.